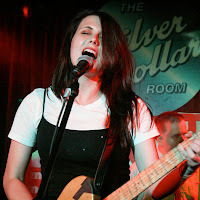 The Little Red Umbrella: Stella Ella Ola & Dangerband Play Sneak's On Thursday — For Free! Stella Ella Ola & Dangerband Play Sneak's On Thursday — For Free! Well, if you read The Little Red Umbrella — like, at all — you're probably already more than aware of Stella Ella Ola and Dangerband. They're two of our favourite new bands in the city. Both play retro-'90s power-pop full of hooks and sing-along choruses. Dangerband's is sweaty and drunken rock 'n' roll; Stella's is sunshine-y and summer-y, featuring a couple of members of Hollerado. So we thought we'd pass along the drop-everything-it's-so-exciting news that both bands will be sharing a bill at Sneaky Dee's this Thursday night (that's August the 8th) and that it will be completely FREE. So there's really no excuse: what better chance to check out some of the happiest, hand-clapping-est indie rock Toronto has to offer? Doors at 9; awesomeness at 9:30.